One more trip has taken place on the 22nd of February. This time exchange students accompanied by ESN’ers, headed to the Pažaislis monastery in Kaunas. It is the largest monastery complex in Lithuania and is also a charming example of Baroque architecture. The monastery was founded in the 17th century by the Grand Duke of Lithuania K. Z. Pac for the Order of the Camaldolese monks. Taking a quite crammed trolleybus ride our little group finally reached the destination, however there was still a lengthy walking distance ahead to reach the monastery itself. Eventually the silhouette of this magnificent complex was noticeable. The weather was getting better and the moods were rising. Firstly, we visited the museum where the history of Pažaislis was presented and some of the artifacts were displayed. However, the biggest impression was left by the models of a monk and a nun, which were made from wax and seemed like real. After taking a group photo in the yard we visited the Camaldulian’s crypt, where the dead were laid a long time ago. From there a path led inside to the main Church, where we could admire the amazing frescos in the central nave and the Chapels. Even though later we went to see the Sacristy it could not match the beauty of the frescos in the central part of the Church. When we stepped outside everybody noticed that inside was much colder, so the group stood in the sun for a couple of minutes to shake of the chill that was left from the visit. As the excursion was over the group separated in half when some people were hurrying home and other headed to the Yacht club situated nearby. There we took a short walk along the dock and looked at the Kaunas Reservoir, which is the largest Lithuanian artificial lake. The stroll made everyone a little bit tired and hungry, but nevertheless happy. 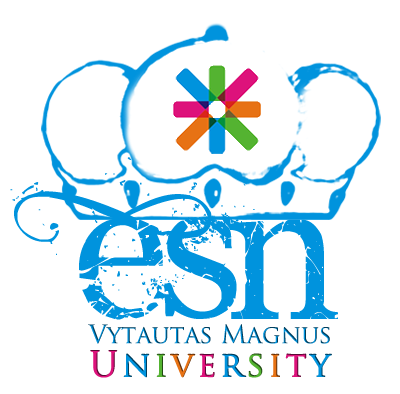 Think differen, think ESN VMU!